Hyde’s sails have been performing in the big boat arena for many years, where the company has successfully applied the expertise it is renowned for in the small boat field to produce race-winning sails of the highest quality. Hyde’s experience in delivering high volume yacht sails for the charter market, as well as top-end race boats, meant the company was ideally placed to fulfil the demanding needs of the brand new matched fleet of 12, 70ft ocean racers competing in the Clipper 13-14 Race and securing the contract for the 15-16 Race. Chairman and founder of the Clipper Race, Sir Robin Knox Johnston said: “Having made their debut in Clipper 09-10 and proved their worth, Clipper Ventures are extremely pleased to welcome Hyde Sails back as the Official Sails Supplier for the ninth edition of the biennial race. Whilst alongside supporting Clipper in there on the water activities we have been key in providing Sails for Sir Robin Knox Johnsons Last campaign that gave us a spot in the podium position with a third place. With our brand new fleet of 12 ocean racers, this will be the largest race we have ever produced and it is essential that during the 40,000-mile race, our fleet is kitted out with a wardrobe of sails that will be able to withstand the extreme battering it will receive over the 11 month race. Hyde’s Yacht Manager Martin Newman said: “We are delighted to be part of such an exciting race. 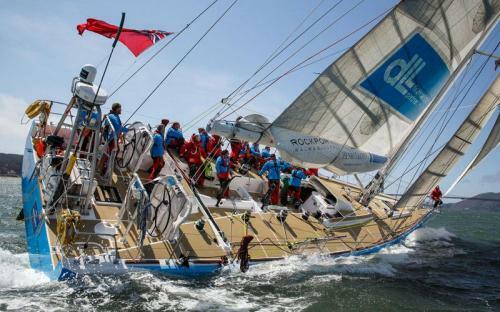 This will be Hyde Sails’ forth race, and all the experience gained through the last two races has gone into the development and production of the sails for the new Clipper 70s. We really enjoy the challenge of meeting the evolving demands of the Clipper Race, which is longer and tougher than it has ever been.The sails are a vital ingredient for the success of boats and the race, and our continued partnership is a nice illustration of Hyde Sails’ quality and reliability. It is a great partnership as we enjoy pushing our products, the latest designs and technology to the limit. As one of the world’s largest volume sail producers, Hyde’s specialist loft in the Philippines has a wealth of experience and a highly skilled workforce, which consistently produces top quality race-winning sails. The talented UK-based design team is complemented by Hyde’s UK service network, while the company’s worldwide distributor network adds the perfect global dimension. A Hyde Clipper Race Premium sail is designed to be the best sail that you can buy with a proven pedigree. It is built using the best quality cloth and Hardware to produce a sail that will get you across the world and back again!